If you’re wondering what all the sand on the Broadway Pier was for, it was the seventh annual U.S. Sand Sculpting Challenge. Competitors from all around the world compete this Labor Day Weekend to build some of the best sand sculptures around. 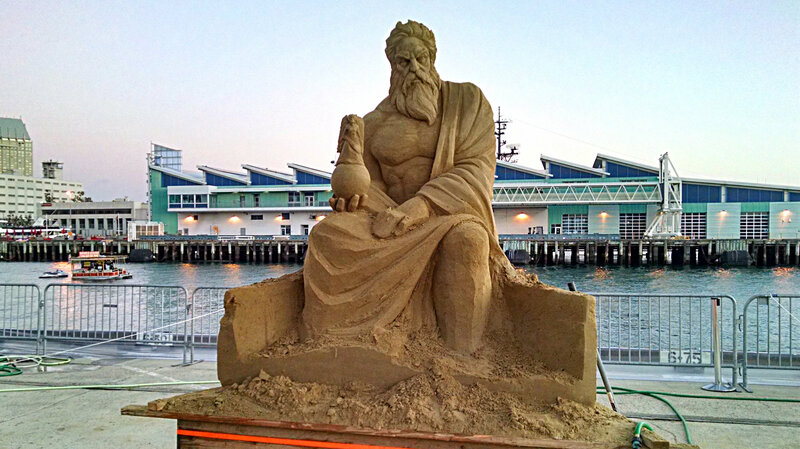 When completed, the sand sculptures will stretch nearly 1,000 feet over San Diego Bay. The Sand Sculpting Challenge goes from 9 a.m. to 5 p.m. Friday, 10 a.m. to 7 p.m. Saturday and Sunday; and 9 a.m. to 5 p.m. Monday. Tickets are $5 for children and $7 for adults. It’s one of the longest-running car events of its kind in the world and the largest all-European car events on the West Coast. The event features more than 3,000 European cars from throughout Southern California. You can show off your car and meet other enthusiasts. There is also drag racing until 5:30 p.m. during the festival. There is also an after party. The Big SoCal Euro goes from noon to 7 p.m. at SDCCU Stadium. Admission is free. Stop the grapes and drink the wine, that’s basically what’s this festival is about. This year is the 22nd anniversary of the Julian Grape Stomp Festa that continuing the old-world tradition of squishing tons of grapes with your feet. Ten local wineries are also offering samples of their offerings. There is a wide variety of food as well as shopping opportunities. The event goes from 11 a.m. to 6 p.m. Saturday at Menghini Winery. Tickets are $15 for adults and $5 for children 5 and over. A $65 VIP ticket gives you access to the exclusive barbecue pig roast and a fast pass to the day’s grape stomps. The Powpow is a time where Native Americans meet and dance, sing, socialize, and honor their cultures. This weekend, the Barona Band of Mission Indians will host a weekend of contest dancing in a variety of categories and you’re invited. The event features camping, drums and cultural immersion. The Annual Barona Powwow is free and goes from Friday to Sunday. Plumeria, the flower that is ubiquitus on the Hawai’ian islands. This weekend the flower and Hawai’ian culture will be celebrated at Balboa Park. The 19th Annual Hawai’ian Plumeria Festival Flower Show has everything you’d want to know about the exotically fragrant flowers, which are known to flourish in many parts of California. There will also be Hawai’ian dance and musical performances during the two-day run of the festival. The Plumeria Festival goes from 10 a.m. to 4 p.m. Saturday and Sunday. Admission is free.